This is a very serious patented safety device. It will eliminate divots from your hand and flying pieces of material. For you home gamers and weekend warriors just consider what a trip to the emergency room for stitches on your hand is worth. For production drilling it eliminates the constant requirement of clamping and unclamping work that is to be drilled. It is preloaded to exert 60 lbs. of downward pressure. Each additional inch adds at least 60 lbs. more. Try putting that much pressure with your hand. It is very easy to adjust and install. Just make sure that the clamp's foot is a little below the drill bit, and lock it tight.There are two holes so that you can drill into a 2" square or use the other hole to drill up to 4" diameters.Swing the foot to one side for even larger diameters. 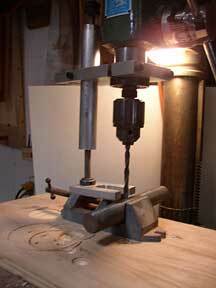 The unit itself clamps onto the drill press quill and moves up and down with the drill bit. It is ideal for setups that require instant drilling. I recommend that the drill press table be covered with 3/4" ply or particle board to protect the steel table and drill bits.It also increases friction which makes for a better grip. 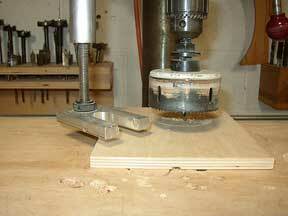 Clamps Onto Virtually Any Drill Press. Effectively Holds Work Down While It Is Being Drilled. Even For Off The Edge Drilling. The Lewin Drill Press Clamp Can Be Used In Many Different Configurations As Shown Below. 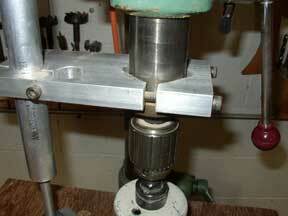 The clamp is used to hold down a small vise which in turn is holding a small piece of steel that is being drilled. The foot has been turned 180 degrees so that a larger bit can be used. This is a 3.5" hole saw. 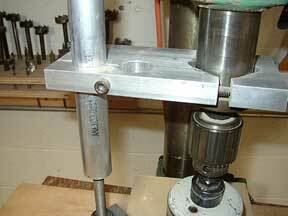 In this set up a fixture has been clamped to the drill press table so that accurate volume drilling can be quickly achieved. 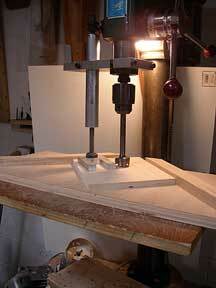 First: Attach The Lewin Drill Press Clamp To The Quill Of Your Drill Press. Second: Choose Which Hole You Need. This Depends On the Size Of The Drill Bit And The Size Of The Material You Are Going To Drill. 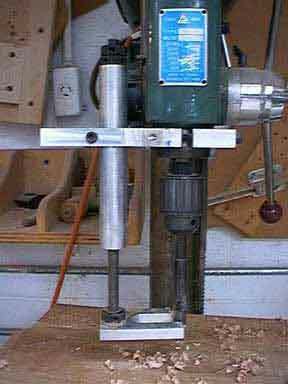 Third:Set The Height Of The Lewin Drill Press Clamp Just Below The Drill Bit. 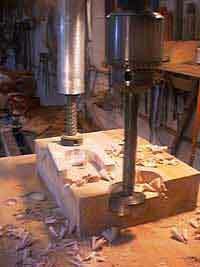 This Insures That The Lewin Drill Press Clamp Engages The Work Before The Drill Bit Does. Make Sure To Tighten The Round Knurled Nut To Lock The Foot. This Keeps It From Rotating. To Increase Beginning Drilling Pressure, Tighten The Top Knob. 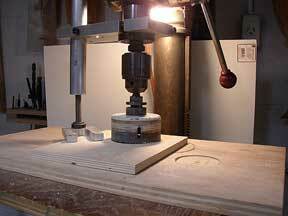 The Lewin Drill Press Clamp can now be purchased from Custom Wood Design (that's me Howard Lewin). Please Call 310-679-2485 for information and pricing. Or Use PayPal. Free Shipping in the U.S. For International Shipping please call or e mail for rates.